With our rich industry experience and knowledge, we are engaged in offering high quality range of Ultrasonic Sewing Machine ( Manual ). 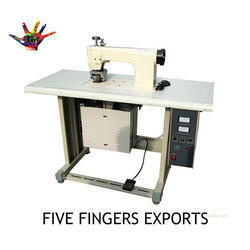 Our offered machine is widely used sewing non-woven and woven bags. This machine is manufactured by our deft technocrats using optimum quality components and contemporary methodology in tandem with set industry standards. Also, in order to ensure its functionality, this machine is stringently tested on various parameters prior to deliver at our clients' end. Looking for Manual Ultrasonic Sewing Machine ?